Get recipe organised! Save recipes from your favourite websites and magazines. Scan recipes from books and magazines. Access recipes from your mobile, tablet and desktop devices. Always available offline. Plan meals and create shopping lists. Cook with intuitive displays, timers and much, much more! 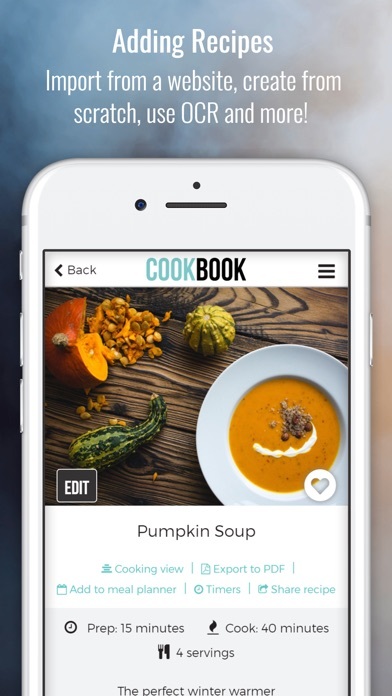 CookBook is the best Kitchen tool around and the only recipe app with real-time OCR. Key Features • Import – save recipes from websites, enter from books or use your culinary expertise and update on the fly with new ingredients, steps and pictures as you cook. • Offline recipes – All recipe data and images are saved locally for offline usage. • Cloud Storage (FREE!) 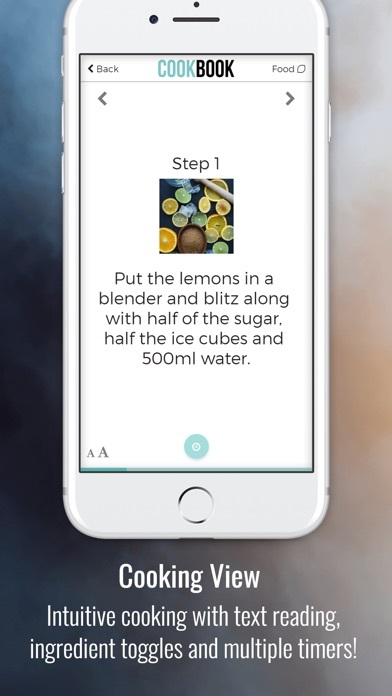 - Automatically synchronises and stores your recipe information with our CookBook cloud to enable access from the mobile applications and our FREE website. • Convert - Seamlessly convert ingredients from your entered and imported recipes to your preferred US, Imperial and Metric measures. 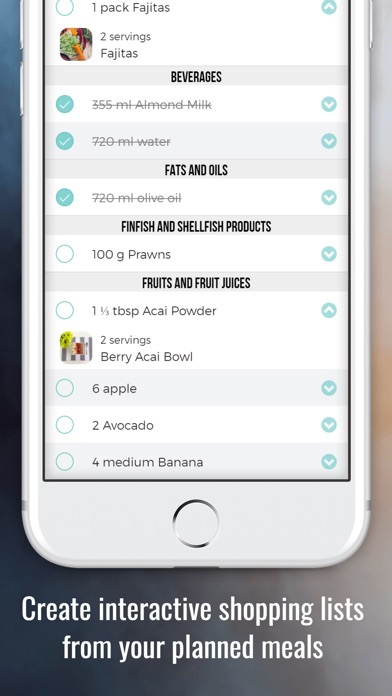 • Meal Plan & Shopping – plan your weekly meals with the required servings and create interactive shopping lists from your plan to take shopping or to export and use later. 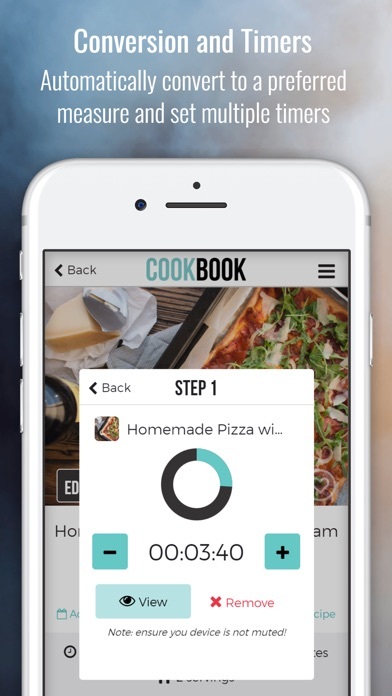 • Cooking Mode – Intuitive cooking with text reading, ingredient toggles and multiple timers! 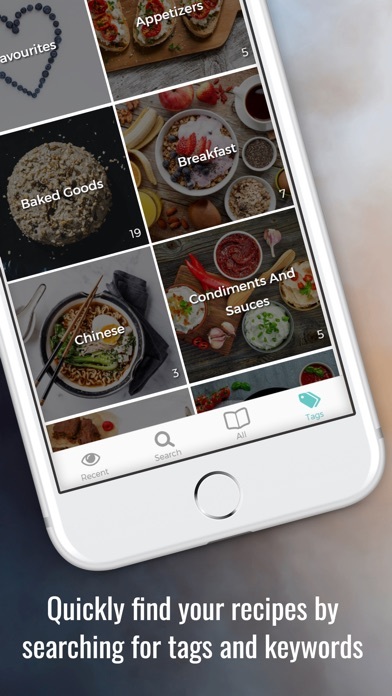 • Search – find by ingredient, tag your meals with categories or make them a favourite to quickly find and access the meal you are looking for. • Share – send recipes via AirDrop in the CookBook format, PDF, email, HTML or YAML format • Timers – Automatic detection of timers from text • Scan (OCR) – save recipes directly from your camera, straight into CookBook (note: this is now free to use!) • Multi-platform – Access recipe data on our website (FREE!) or from other popular mobile platforms. Extra Features • Select between 2 beautiful sleek CookBook designs. • Quickly scale recipe ingredients to your desired number of servings. 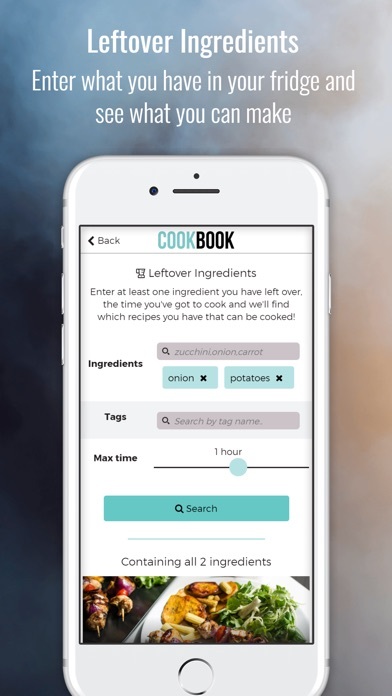 • Search for recipes using the leftovers in your fridge • Create recipe timers automatically from detected instructions or enter them manually to alert you when you are needed in the kitchen. • Run concurrent timers across the recipes you are currently cooking to multitask. • Use our default or create new categories to help you keep your recipes organised. • Add an overall photo and individual photos to each recipe step to create easy visual directions. • Recipes available offline to allow you access when you have no internet connection. 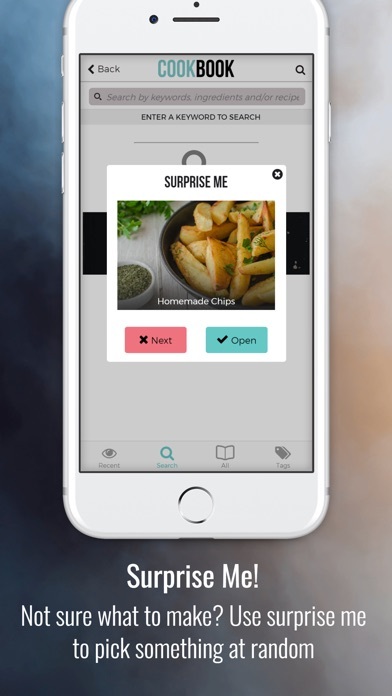 • ‘Surprise me’ feature for those times when you just can’t decide what to eat! • All this and more, accessible on our website or through our dedicated mobile applications, synchronised across your devices, on or offline, with one account and no annoying adverts. Our developers are continually working to perfect CookBook and therefore we want to hear from you, what you think and what you’d like CookBook to do next! Use the ‘Contact Us’ page to get in touch and one of our team will get straight back to you. CookBook Your recipes, your kitchen, your CookBook. I am learning how to add and transfer my recipes. I have 350 recipes to transfer into this new cookbook. I hope you keep up improving this apt as I want to encourage All my family and friends to view and add to this COOKBOOK. I usually don’t write reviews but I feel I must for this wonderful app! It’s everything I’ve been searching for to organize all my recipes, and well worth the price. Thank you for a great product. I don’t like leaving reviews. But this one deserves more than 5 stars, nay, Apple needs to create a different category just for this app. In my MANY years of using iPhone and numerous apps, I’ve never seen such a thoroughly-thought-through app. The developer must have done his homework very well for us users. Every turn you find the developer’s thoughtful, clever, intelligent, and useful addition. There is nothing “I wish it was...”. 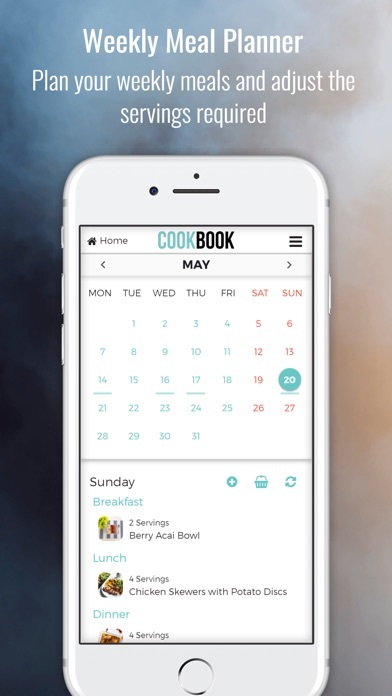 What we could ever think of as the best recipe/meal planner app, this app has it all. The functionality of this app deserves “the App of the Year” easily. And I am not exaggerating even a bit how so well designed app this is and how so well it is working. The OCR is the best part of this app for me. Finally, I could add my favorite recipes from my cookbooks that had been on my bookshelf for ages without being organized. I am importing all my favorite recipes from websites and from my old recipe apps (including Paprika). Cookbook covers all realms of a cookbook ought to be. I finally found a place where all my recipes will be saved. I am not sure how many times I shouted “wow” while building up my cookbook here - there are no unnecessary part in this app. So clean and neat, beautiful and functional, & easy and delightful to use. I’ve never said “thank you” to app developers and this is my first one - THANK YOU for this app which you created with all your effort and time. Your app truly deserves the name “Cookbook”! I tried a few apps sort and catalogue recipes. Cookbook is the only that provides you with the means to capture recipes from cookbooks, websites, magazines or manually. From an image, Cookbook transcribes the recipe into text. Keyword cataloging is an option as well as adding images to the recipe card. Also unlike other apps you are able to upload as many recipes as you like. I love this app. If you are liking for a way to capture and store recipes this app is the best. I ❤ this app! It literally does everything but cook the food for you . The new update is awesome!!!! The only downside is that I now need to move over my entire recipe collection of 5,000 + from my previous recipe organizer because this one is just that good 🤗. Thanks for the great work. Don’t sell yourself short by downloading a free app. Save yourself the headache and get this one. 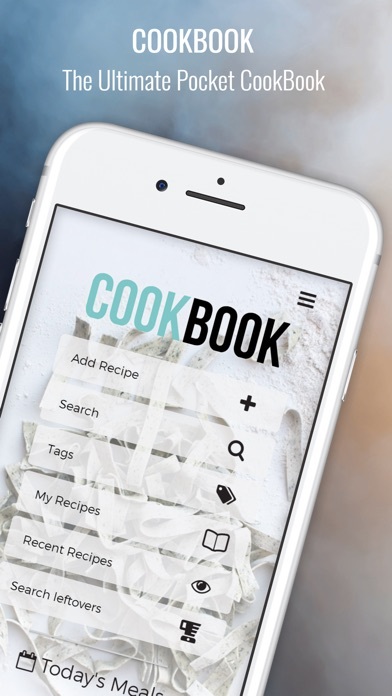 From the best recipe import engine on any app that I’ve seen, to meal planning, to shopping and sharing, this is the best cookbook app out there and well worth the money. Good job developers! This is great. I recently started the Keto diet and was gifted a Keto book. I immediately started looking for apps that could translate a picture into the correct input for recipe creation. This app fits the bill and is the only one on the store that does this. Also the other features like meal planning and generation of grocery lists is great. I just generated my first list for the first week of meal prep. You can select dates to generate lists which is good. Lots of functionality wrapped up in this app! Couple of wants... -Ability to export import recipes into MyFitnessPal. So far I could get this to work. -Ability to quick edit the grocery list items. I discovered an error in one of the items and needed to correct it. However, if you correct the source recipe you have to regenerate the grocery list. -Ability to share the grocery list with my wife. We are logged in to the same account but the grocery list does not show up in her app even after syncing. 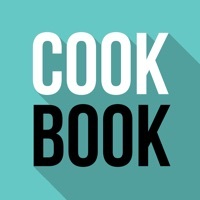 This cookbook app is a breeze to use. The ocr is about perfect I’ve been able to pull in a ton of my recipes into one place. The grocery portion is pretty slick. 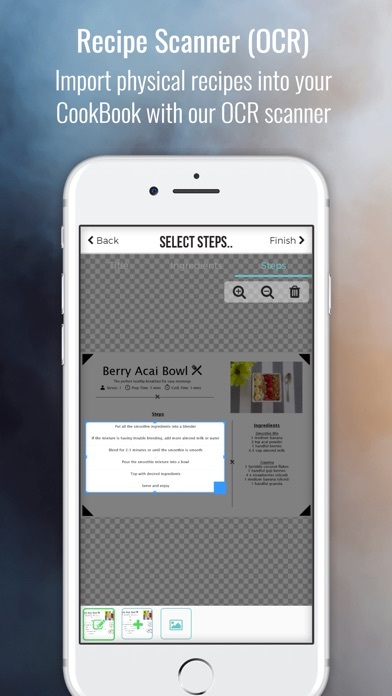 It pulls in all the ingredients that I need for the recipes and I can remove those that I have on hand and it also has a feature to add additional items so I don’t have to have multiple shopping lists. And I don’t have to worry about leaving the list at home because it is also on my phone. I got fed up after losing years worth of recipes on Paprika, so I figured I’d try this app out. I had a question about the app before my purchase, and I was contacted within hours by the kindest lady. This was an instant purchase, and I’m loving it so far. I’m a professional cook, and I love the leftovers option, mostly as inspiration. Thank you all, keep up the great work.